INMO members on the picket line outside Beaumont Hospital in Dublin last Wednesday. THE INMO HAS said an invitation from the government for nursing unions to engage in negotiations on issues other than pay is “massively disrespectful” and “cynical”. The Ministers for Health and Finance made the offer in a statement released earlier today. Responding, INMO General Secretary Phil Ní Sheaghdha said said: “This is spin masquerading as substance. Government by press release is unfair and confusing to patients and insulting to nurses and midwives on the picket lines. Separately, Ní Sheaghdh told RTÉ Radio 1′s Drivetime the ministers’ offer was “massively disrespectful” and “one of the most cynical moves I’ve seen in a long time, and I’ve been involved in industrial relations for over 20 years”. Members of the INMO and the Psychiatric Nurses Association (PNA) started their industrial action last week, with several other days of strikes planned. The disputes centre on pay, conditions and staffing levels. In a joint statement released earlier today, Health Minister Simon Harris and Finance Minister Paschal Donohoe said they “note with disappointment that further strike action by the INMO is going ahead tomorrow and Thursday”. “The government has always listened to the concerns expressed by nurses in relation to working conditions and job satisfaction as well as the patient experience,” the statement notes. It adds that the ministers “continue to be willing to engage in talks on the range of workplace related issues other than pay to try to resolve the dispute”. This initiative could focus on the contribution and arrangements for the further roll out of the Safe Staffing Framework to improve staff and patient outcomes and reduce reliance on agency staffing in our hospitals. The ministers called for “immediate engagement” with relevant union interests, noting that the Workplace Relations Commission remains available to facilitate such talks. Over the weekend, nurses and midwives voted to stage a further two additional strike days as they escalated their industrial action. 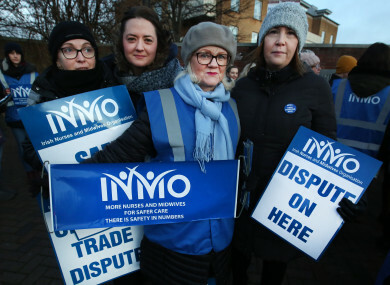 The INMO met on Saturday to discuss the potential for further strikes beyond the dates already set for industrial action – 5, 7, 12, 13 and 14 February. The new strikes will take place on 19 and 21 February. The first 24-hour strike by INMO members took place last Wednesday. Earlier today, psychiatric nurses announced they are escalating their strike action planned for this week. The Officer Board of the PNA met today and agreed that the planned overtime bans due to take place tomorrow, Wednesday and Thursday will be escalated on the second two days (6 and 7 February) to full 24-hour bans including overnight rosters. Tomorrow’s ban will remain as a daytime overtime ban. The action will apply to adult mental health services. PNA members held their first overtime ban last Thursday. Peter Hughes, PNA General Secretary, said this week’s action by psychiatric nurses is going ahead “in the absence of any meaningful engagement or proposals from the government to address the recruitment and retention crisis in nursing”. Hughes said the extension of the overtime ban to overnight hours on Wednesday and Thursday would “unfortunately show the reliance of mental health services on overtime, despite the repeated assurances from government that there is no substantive issue with understaffing and recruitment and retention in mental health nursing”. A joint PNA and INMO rally will be held at the Garden of Remembrance, Parnell Square, Dublin city, at 12.30pm on Saturday. An opinion poll has shown that three-quarter of Irish people support the nurses’ strike action. Taoiseach Leo Varadkar echoed these sentiments when asked about the strikes last week. TheJournal.ie spoke to nurses on the picket line outside the Mater Misericordiae University Hospital in Dublin last week. Email “INMO calls ministers' invite to talk about issues other than pay 'massively disrespectful' and 'cynical'”. Feedback on “INMO calls ministers' invite to talk about issues other than pay 'massively disrespectful' and 'cynical'”.